If you’re looking for a way to get rid of the visible wear and tear on your hardwood floors in West Ashley, SC, hardwood floor refinishing is the perfect option. You don’t have to pay to get brand new hardwood floors in your home. Give us a call to discuss the alternative solution of hardwood refinishing. Our specialty service is perfect for restoring brilliance and value to your home and your floors, without a price that reflects that high value. 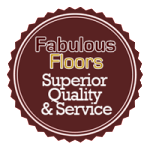 Fabulous Floors Charleston has worked in the industry for many years and we love transforming dull floors into masterpieces. Our streamlined process and highly efficient wood floor technicians are sure to deliver superior hardwood floor refinishing in West Ashley. If you have more questions or would like a quote, contact us today! Our years-long continual perfection to our hardwood refinishing technique has shown us the best way to renew floors. First, we carefully remove any carpet and/or residue remaining on your floors. We use our high-powered, yet gentle sanding equipment to smooth and eliminate the dings and scratches that have accumulated over the years. Our sanding process is virtually dust free, so you won’t have to worry about cleaning up a big mess. Next, we apply the shade of stain of your choice to make your home and floors just the way you want them. Finally, we will add a coat or two of our polyurethane finish for protection! Ready to fall in love with your hardwood floors again? Our number is below, so give us a call today! Contact us today to learn more about our hardwood floor refinishing service in West Ashley, SC!